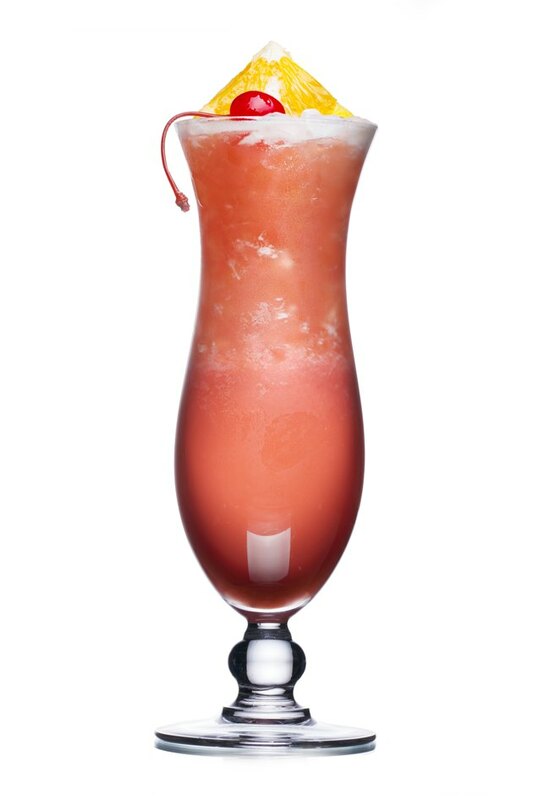 The Hurricane is a mixed beverage containing alcohol and a number of sweet ingredients, including orange juice, grenadine and sugar, which create a fruity flavor that overpowers the alcohol. Because the amounts of the juice, grenadine and sugar are small, a Hurricane is relatively low in carbohydrates, but the alcohol content makes this drink high in calories. However, because recipes can vary, so can the calorie content. A 6 oz. Hurricane alcoholic drink provides 250 calories. This amount of calories comprises 12.5 percent of your daily calorie intake, based on a 2,000-calorie diet. Hurricane alcoholic drinks are not ideal for dieters, as many alcoholic beverages are lower in calories than Hurricanes. For example, a 12 oz. beer contains 138 calories, while a rum and diet soda provides 65 calories. One 6 oz. serving of a Hurricane cocktail provides just 6 g of carbohydrates. All of these carbohydrates come from sugar. The drink does not provide any fiber, a nutrient that promotes feelings of fullness. Hurricane cocktails are rich in calories because these drinks contain a lot of alcohol. Each Hurricane provides 1 oz. of light rum and 1 oz. of dark rum. A 6 oz. Hurricane drink contains 32 g of alcohol, which provides 7 calories per gram -- nearly twice the caloric amount of carbohydrates and protein. Hurricane alcoholic drinks do not contain any protein. Protein provides your body with amino acids, which are structural components of hormones, skin and other bodily tissues. Hurricane alcoholic drinks do not provide any dietary fat. This nutrient is higher in calories than alcohol, with 9 calories per gram, but it does aid in proper growth and development, so even when dieting, it's important to consume dietary fat.